Historical & geographical feature. Roll your mouse over the images to navigate! FM 89.9 Norfolk Island was unexpectedly heard in Brisbane during the witching hours and early morning of November 28th, 2009. It has not been heard since. Unusual weather in the troposphere enabled this reception to occur. Colloquially, this phenomenon is referred to as tropo ducting. For more details on tropo ducting, please visit the learning resources referenced elsewhere on this site. Luckily for Australians, tropo occurs all year round, but seems to be more prevalent on days where warmer than average temperatures exist. It seems no coincidence that unseasonal bushfires were occurring throughout coastal New South Wales on the day of this reception. Please be sure to visit my detailed tropo page with analysis of the synoptic, evaporative and temperature conditions for this day, including colour charts. 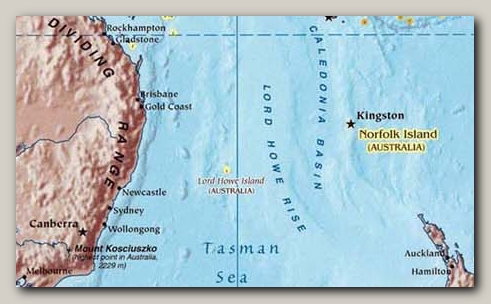 Norfolk Island is situated off Kempsey, NSW. Entirely surrounded by the Pacific Ocean, Norfolk is a renowned tourist destination for history buffs. It is reputed to have been home to some of the most terrifying and brutal convict experiences in colonial Australia. Norfolk also offers spectacular scenery, and is best described as an island paradise these days. To protect the pristine environment, the living population has been capped, so I don't think you can migrate there, as tempting as it seems! This is the first documented reception of a Norfolk Island broadcast FM station heard via tropo in Australia. The station was heard on two consecutive days. It was audible for over 4 hours on both days. For low-powered ham operators using 144 MHz (the 2 Metre band) in Brisbane, Kempsey and Sydney, this tropo path to Norfolk Island is quite established over summer. As no permanent ham operators live on the island, there are no indicators as to when tropo between Australia & Norfolk Island exists. 89.9 Norfolk Island is a community radio station broadcasting with an Effective Radiated Power of 250 watts. The broadcasting site is located 1,477 kilometres from the receiving location in suburban Brisbane. At night time, FM 89.9 Norfolk Island relays the Remote Western Australian Spirit Network uninterrupted (that is, including ads). Hearing Western Australian ads can be a little confusing for those unaware listeners! Daytime programming is predominantly locally hosted. News is sourced from the Australian Broadcasting Corporation, Radio New Zealand and other sources. The station also simulcasts on AM. The old callsign is VL2NI. Throughout these recordings, you may occasionally hear meteor scatter lasting a few seconds from ABC Local Radio 2RVR Cootamundra, NSW if you listen carefully. The tuner used was the modified Yamaha T-28. The antenna used was the Clipsal external FM antenna. Mozilla users: to download, please move your mouse onto the tape, read the description & Right Click 'Save Link As'. These clips and photographs are subject to copyright. Please refer to the notices. Audio clips: Please note that each respective broadcast station holds exclusive rights to any musical performances contained in those clips. Portions of broadcasts provided here are made available under the Fair Use (specifically the educational and scientific) provisions of the Copyright Act. The relevant jurisdiction for this website is Queensland, Australia. Images: The photographs appearing on this page are protected by copyright. Where necessary, permission has been sought from the photographers (or publishers) for public use on this page. Photographers retain exclusive rights to their works. These works should not be retransmitted for commercial use without the express permission of the copyright holder. Licensed from XC.hu/HAAP Media Ltd.